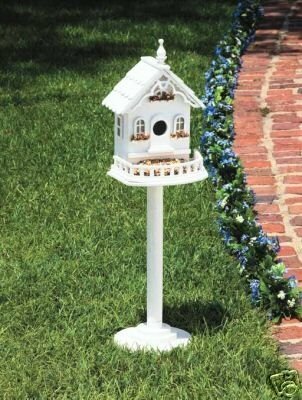 This is an elegant and beautiful freestanding Victorian Birdhouse. It is made of wood and painted white. A sturdy freestanding pole and base are included. This makes a great garden accent! It measures 9 3/8" x 8 3/8" x 29 1/4" high. PLEASE NOTE: Shipping ONLY within the continental U.S. **Hawaii, Alaska, and Puerto Rico must contact seller for shipping quote before ordering.